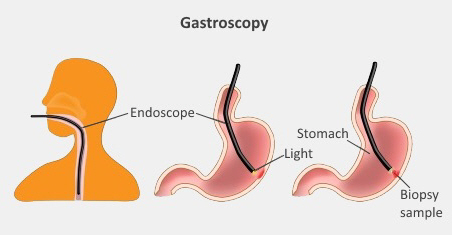 When you eat, your food passes from your mouth into your food pipe (oesophagus) and then into your stomach. Your stomach has an opening from your oesophagus and an exit into your small intestine. It is full of strong acid and chemicals called enzymes, which work together to break down the food you eat. To stop the acid and enzymes from damaging your stomach, your stomach and first part of your intestines are lined with an alkaline mucus (alkaline is the opposite of an acid). This stops the acid from damaging your stomach. A peptic ulcer happens when the acid and enzymes start to damage the lining of your stomach or intestine. When there is an ulcer in the lining of your stomach it is called a stomach or gastric ulcer, and when the damage is in your small intestines it is called a duodenal ulcer. The term peptic ulcer can apply to either of these. Peptic ulcers are more common in women than in men. Worldwide, most peptic ulcers are caused by infection with a germ (bacterium) called Helicobacter pylori (H. pylori). However, this is less common in New Zealand. You can find more information about H. pylori, and how it's treated, on the next page. Peptic ulcers can also be caused by some medicines, for example, non-steroidal anti-inflammatory drugs (NSAIDs), such as ibuprofen, naproxen, diclofenac and aspirin. These medicines are usually used as pain relief, or in the case of aspirin to reduce your chance of a heart attack or stroke. They can weaken the mucus lining in your stomach, so an ulcer develops. Sometimes, peptic ulcers can be caused by stomach cancer, but this is very rare. black bowel motions (poos) or blood in your bowel motions. Occasionally people get very unwell with a peptic ulcer, because it bleeds internally, causes a hole (perforation) in your stomach or small intestine, or causes a blockage in your digestive system. You may need a gastroscopy (also called an endoscopy) to confirm you have a peptic ulcer. This involves passing a long, thin flexible tube with a tiny camera on the end down through your mouth or nose into your stomach. You have a gastroscopy at hospital, and usually will take a medicine that relaxes you and makes you sleepy, to make it easier. The camera lets doctors see into your stomach and small intestine. If they see an ulcer, they can take a small sample (biopsy) to check what kind of ulcer it is, so you get the right treatment. They can test you for H. pylori at the same time. The main treatment for is with medicines called antacids, which cut down the amount of acid your stomach makes. The medicines are omeprazole, lansoprazole, pantoprazole, ranitidine, and famotidine. If you have an H. pylori infection, you will also need antibiotics to treat this. If your ulcer was caused by medicines such as NSAIDs, doctors will probably recommend that you stop taking these. If the ulcer is severe and causes problems such as bleeding, perforation, or blockage, you will need surgery to treat these. Written by HealthInfo clinical advisers. Endorsed by GP liaison, Gastroenterology, Canterbury DHB. Page created May 2017.